Although college presidencies are judged by historians who examine the big picture—the broad sweep of years seen through the lens of new buildings, innovative programs, and enrollment successes—presidents themselves are remembered for the much more finely drawn detail of their personal style: the qualities they bring to their work and the way they conduct themselves day in and day out in the most challenging and demanding position in higher education. For Richard Cook, who retires this summer after twelve years as president of Allegheny College, that style might be summed up in a simple lesson learned in childhood. In many ways those notes symbolize a presidency that has brought a remarkable vision into reality. By building relationships, Allegheny’s twentieth president has built much more, strengthening the institution and creating an increased presence on the national stage for Allegheny College and its programs and people. Evidence of those shared values and approaches can be found in the obvious respect that the Allegheny faculty and staff have for the College’s president. Whereas other institutions sometimes make the news because of rancorous relations between faculty and administration, Allegheny trustee Bill Steffee ’57, who served on a trustee committee that evaluated Dr. Cook’s performance, says that faculty reviews were without exception positive. Those glowing comments have been well earned. Allegheny is on a sound financial footing, and applications to the College under Dr. Cook’s leadership have steadily increased, resulting in higher selectivity and a better fit between student and institution. The College’s profile on the national educational landscape has become both more prominent and more sharply defined. But, perhaps most telling of all, Allegheny is a place where relationships are genuine and where respect for others starts at the top, where the president sets the tone for civil, informed, and engaged dialogue, and where students learn that sometimes it’s more important to listen than to talk. The respect and pride that Dr. Cook so obviously feels when he speaks about Allegheny students and alumni have paid dividends in stronger, more vibrant connections among the College community. More alumni are lending their talents, skills, and expertise to the College than ever before, whether it’s as members of the Alumni Council, planners for their class’s next reunion, or mentors to current students. (When the alumni office sent out a request recently for graduates to serve as mentors, more than 1,400 alumni responded.) It’s a connection—between college and alumni, between alumni and current students—that Dr. Cook has forged through assiduous attention to a collaborative working relationship with student groups such as Allegheny Student Government. Once students feel truly invested in the success of the College, graduation cements rather than attenuates their relationship to Allegheny. 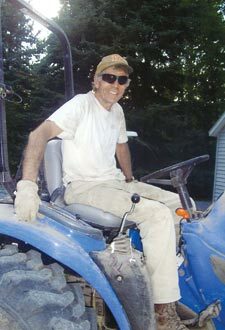 Now, as executive director of the Redevelopment Authority of the City of Meadville, Andy Walker sees that same accessibility in the way that Dr. Cook keeps the connections strong between town and gown. Dr. Cook has viewed himself as a partner in the region’s development from Day 1 of his presidency, keeping the lines of communication open between town and gown and working with city and county officials, school boards, the Chamber of Commerce, and nonprofits throughout the region to put the expertise, energy, and enthusiasm of students, faculty, and staff to good use in the community. And Dr. Cook takes a very personal interest in helping to create a thriving community that will allow the College to continue to flourish. One of the highlights of his year is October’s Make A Difference Day, when he and his wife, Terry Lahti, roll up their sleeves and work alongside students to paint a garage, rake leaves, or even roof a house for Meadville residents who can use a helping hand. Word on the street is that students on Dr. Cook’s team always had to work extra hard and twice as fast as other teams to keep up with the president and his wife. As Allegheny’s visibility in the local community has increased—it’s not unusual, for example, to hear the head of a nonprofit agency remark that she couldn’t keep the doors open if it weren’t for student volunteers from the College—so has Allegheny’s reputation and profile on the national scene. Over the last twelve years, reporters have learned that they can call Dr. Cook and get straight talk on the complex national issues facing higher education, to the point where Allegheny has become known as a “go to” school for education reporters looking for solid information and sound opinion. The New York Times has quoted Dr. Cook numerous times and talked about Allegheny in a page 1 story on January 1, 2006, but the College and its people and programs have also been featured in the Wall Street Journal, Washington Post, USA Today, Christian Science Monitor, CNN, Pittsburgh Post-Gazette, the Chronicle of Higher Education, and Renda Broadcasting outlets, among many others, including Web-based media such as salon.com and Yahoo News. That kind of recognition doesn’t happen overnight. Rather, it’s fostered by the challenging work of serving with peers in the trenches of higher education. Dr. Cook has served on the board of the Council of Independent Colleges (CIC), as a member of the Association of Governing Boards of Universities and Colleges, and as chair of the Association of Independent Colleges and Universities of Pennsylvania. He has also taken a leadership role as Division III schools in the North Coast Athletic Conference do some soul-searching about reorganization of a division where the colleges range from 400 students to 40,000. Dr. Cook has also thoughtfully and energetically nurtured the College’s connection to legislators at the regional, state, and national levels, resulting in increased appreciation for the role that Allegheny—and its alumni—play in the world, appreciation that sometimes translates into dollars. During the last fund-raising campaign, for example, the College received $15 million in state and federal grants. State legislators—not all of them alumni—were instrumental in helping to secure $4 million in Commonwealth funding to aid in the construction of the Vukovich Center for Communication Arts, a community resource scheduled to open this fall. Allegheny’s most recent fund-raising campaign was the most ambitious—and successful—in the College’s history, raising more than $115 million, which was $10 million over goal. At the campaign’s conclusion, Tom St. Clair ’57, who chaired the effort with the late David Hoag ’60, summed up Dr. Cook’s work in securing the gifts that would make the difference between maintaining the status quo or accelerating the College’s climb to national prominence. Dr. Cook also nurtured Allegheny’s relationships with foundations, including a now strong relationship with the Corella & Bertram Bonner Foundation, from his first year on campus. The result has been the establishment of both a Bonner Leaders program and a Bonner Scholars program at Allegheny. To date, the Bonner Foundation has made grants of more than $200,000 in support of Allegheny’s two Bonner programs, which engage students in significant service to the community during the academic year and summers. Furthermore, the Bonner Foundation has recently approved an endowment grant approaching $3 million to Allegheny to permanently support the program. Two other aspects of the campaign give insight into the character of the Cook presidency. Eighty-five percent of the College’s employees donated a total of $2,075,398 to the campaign. Not only are faculty and staff loyal to Allegheny, which indicates high morale, but they are so confident in the College’s leadership that they are willing to return a portion of their own salaries to the institution. In addition, Richard Cook and Terry Lahti made their own gift to Allegheny College during the course of the campaign: $500,000. In fund-raising parlance, that’s known as a stretch gift. It’s also virtually unprecedented among college presidents. 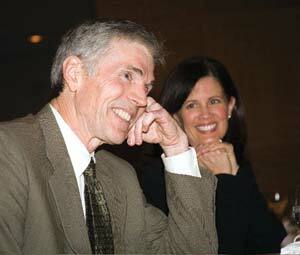 Part of Dr. Cook’s success as chief fund-raiser for Allegheny is based on his reputation as a careful steward of the College’s resources. Those who give to Allegheny College know that the president and his staff will make the most of every dollar. 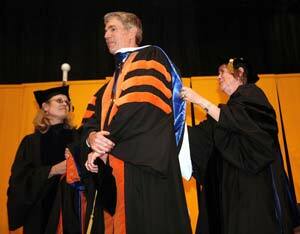 President Cook—flanked by Dean of the College Linda DeMeritt and Secretary of the Faculty Courtenay Dodge—is awarded an honorary doctorate of humane letters, honoris causa, at Commencement ceremonies on May 11, 2008. That commitment to responsible stewardship also frames the leadership role that Dr. Cook has taken on sustainability issues. One of the early signatories of the now 500-member American College and University Presidents Climate Commitment (ACUPCC)—a national challenge to colleges and universities to develop a comprehensive action plan to reduce greenhouse gases by becoming more energy- and materials-efficient—he now serves on the ACUPCC’s steering committee. Through his foresight, Allegheny was selected as one of eleven ACUPCC signatories that will launch pilot projects to further green their campuses—and was the first college or university in the nation to submit a request for proposal from energy service companies under the program. Other milestones on the road to sustainability have been Dr. Cook’s appointment of a Task Force on Environmental Responsibility, development of a set of environmental guiding principles that shape the College’s approach to environmental stewardship, installation of an advanced composting facility, and a commitment to “green,” energy-efficient building, such as the North Village residential complex. Working to create a renewed interest in the College’s history and traditions, Dr. Cook has been as careful a steward of Allegheny’s history as he has been of its other resources. During the last twelve years, the History and Heritage Committee began their work, Jonathan Helmreich’s weighty Through All the Years: A History of Allegheny College debuted, the campus community once again began to celebrate Founder’s Day, the Merrick Historic Archival Center opened its doors and the position of college archivist was created, and historic buildings such as Cochran Hall, housing the Patricia Bush Tippie Alumni Center, were lovingly restored. Paralleling Dr. Cook’s commitment to the wise use of College resources is a passionate commitment to civic engagement. 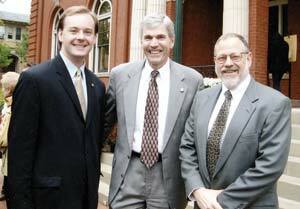 In addition, under Dr. Cook’s leadership, Allegheny became one of only ten colleges nationwide invited to be charter members of Project Pericles, an innovative program of the Eugene Lang Foundation to create national models for other institutions that want to provide to their students effective education on citizenship and social responsibility. The College is also one of twenty-eight institutions invited to be part of the Leadership Consortium of the Association of American Colleges and Universities’ Core Commitments program, which explores how higher education can foster engaged citizenship, teach personal and social responsibility, encourage a respect for diversity, cultivate excellence, and implement programs that support community engagement. During his tenure, the College’s Center for Political Participation (CPP) opened its doors. The CPP has sponsored programs ranging from Model Campaign USA, in which high school students learn through hands-on experience the ins and outs of running an effective—and ethical—political campaign, to an all-day event in February that brought political leaders together with student teams from as far away as New Hampshire to begin a national discussion giving American voters a voice in reformation of the presidential nomination process. At the meeting of the College’s board of trustees in February, the board and other representatives of the College community surprised President Richard Cook with the news that a new environmental center, to be housed in Carr Hall, will be named in his honor. The Richard J. Cook Center for Environmental Science will provide even more visibility for Allegheny’s already strong and nationally respected programs in environmental science and environmental studies. It will also acknowledge and celebrate the many contributions that Dr. Cook has made to a sustainable future not just at Allegheny but also at college and university campuses across the nation. Civic engagement has become part of the Allegheny zeitgeist, whether it’s through the Values, Ethics, and Social Action (VESA) minor, the Center for Economic and Environmental Development (CEED), the Bonner Leader Program, the Davies Community Service Leader Program, or a host of other initiatives, large and small, that Dr. Cook has always supported and many times shepherded. Life after the presidency of Allegheny College holds many attractions for Dr. Cook—including, he says, having the time to read for pleasure again. He admits that being able to be more active himself in hands-on community projects and service on boards and advisory groups is something to which he looks forward. Alumni have embraced Dr. Cook every bit as enthusiastically and warmly as the on-campus community, as evidenced in 2006 when Dr. Cook and Terry Lahti were awarded honorary alumni status and the Alumni Medal for distinguished service at Allegheny College. As Allegheny College approaches its bicentennial in 2015—a milestone that few colleges in the country have achieved—Dr. 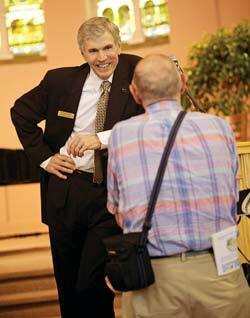 Cook has left Allegheny a remarkable legacy. His tenure has been a period marked not only by extraordinary accomplishment but also by an ability to inspire others to continue building on his vision for Allegheny, a vision that he has crafted with deliberation, innovation, a profound respect for Allegheny’s history and traditions, and, always, a spirit of collaboration. This article was featured in the Winter/Spring 2008 issue of Allegheny Magazine.